I’m a sucker for a good book title, and this book does not disappoint. What a cracker of a book this is by Cal Newport. ‘So good they can’t ignore you – Why skills trump passion in the quest for work you love’ is a confronting challenge to the clichéd advice “follow your passion”. Newport turns this advice on its head, arguing that workplace passion comes from hard work, skill development and deliberate practice. Newport shows that this approach is what develops passion for work, not the other way around. He points out the rare occasions where people have identified a passion which they have pursued into a meaningful career, simultaneously identifying scores of examples of people who have developed a passion through developing skill. Newport’s prime example is Steve Jobs, who didn’t take his own advice of “follow your dreams”, rather he developed skill and passion for a career he fell into. Perhaps an even stronger aspect of this book is Newport’s framework for becoming indispensable, or, so good they can’t ignore you. Newport describes people who develop career capital, by building their own skills, the skills of those around them and adding value to their organisation. He shows how to turn this newly gained career capital into control over your career. This is a great book. It is highly relevant for teachers and educators looking for promotion positions. Its lessons transfer directly into the education sector and the book charts a career path similar to many of the leaders I have worked with. 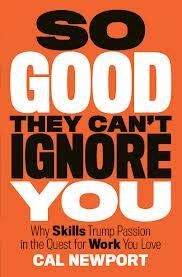 With recommendations from leading thinkers like Seth Godin and Daniel Pink, this book is too good to ignore.